The 1st Dynasty begins with the unification of the Two Lands, Upper Egypt and Lower Egypt, attributed by the Egyptian historian Manetho (3rd century BC) to Menes, who has been identified with either Narmer or Aha. Memphis was chosen as the residence. It is assumed that the 'White Walls' (the name of the actual residence) was situated near Abu Sir. Saqqara became the necropolis; a large number of 1st Dynasty mastabas are located on the northeastern edge of the Saqqara plateau. A stone bowl bearing the name of Narmer was found beneath the Step Pyramid of Djoser. Royal tombs from the Early Dynastic period have also been found at Abydos, however, and it is thought that Narmer is buried there. In addition to Abydos, the Upper Egyptian capital city Hierakonpolis also remained a religious centre. 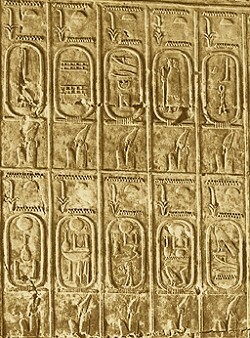 Aha's successor (after a 10-month interregnum by King Iti/Teti) was King Djer, whose tomb at Abydos was later considered to be the tomb of Osiris. Djer achieved an important victory over Nubia, as depicted in a relief carved in the rocks near the 2nd Cataract. Other kings from this period include Wadji, Dewen, Adjib, Semerkhet and Qaa. Dewen was the first who bore the title King of Upper Egypt and Lower Egypt. Ivory and ebony objects have been found in his tomb at Abydos; on one of them is a scene that is probably an illustration of the Sed festival of the king, with the first depiction of the double crown of Upper Egypt and Lower Egypt. Important events during this period include the division of the country into nomes to make it easier to govern, and the first large-scale sea journeys to the Lebanon to collect timber, found among other places in the construction of the tomb of Aha (or one of his high officials) at Saqqara. Rebellious foreign peoples were successfully rebuffed, but by the end of the dynasty the internal situation was restless, mainly because there was still conflict between conquered Lower Egypt and victorious Upper Egypt.